Friendly staff and some of the sites are level and good. Some are not. We had a nice stay. The park is somewhat hard to get around in. Made a reservation and paid with a credit card. When we arrived the lady in the office said I wasn't charged the whole amount. It was their fault but no big deal. Ok how much? $4.25 Ok here is my card. She says I can't put it on a card only cash. Well it is my fault that I forgot to get cash and only had 2 dollars on me. So we have to open up the 5th wheel to get quarters from our laundry stash. We are only staying the 1 night as we are volunteering at a place down the road. (not and rv park, but a fish and wildlife place). Can't go to next place until 1, so I go and ask if it is ok to leave at 1. Again the same lady rudely says after 11:02 it will cost you to stay until 1. Now I would understand if the place was busy, but 3/4 of the park is empty. Not very traveler friendly. We like the area, but will not be back here. Not sure if she is the owner or work camper. Very pretty place to camp. We were right by the fast flowing river and the noise was wonderful to listen to, makes a lovely change from trains and trucks. Check in and parking was very disorganized but they had just opened. We never did get the code for the washrooms but they looked nice from outside! Nice areas for kids and dogs but we couldn’t get the Wifi to work even with the code. RV park was ok if you had a smaller unit. When we arrived, we were greeted and was asked to disconnect our car from our 40' rv. It was a good thing, because where they parked us was not adequate for a 40 foot rig. Very sharp turns up hills and was very difficult to park. Expected a pull through spot. Had to ask other campers to move their vehicles so we could get out of space. Very inconvenient. Had dogs with and pet area was nothing but dirt. Not ideal to walk them in. We love Leavenworth, Wa and will return, however, we will look for a different RV park that really accommodates big rigs. Wow what a nice RV park. We were escorted to our site which was beautiful. Mature trees, grass, cement pad and patio. Lots of shade and very peaceful. The staff was extremely friendly and helpful. They made you feel like you were family. The town of Leavenworth was also beautiful and the near by mountains and river was delightful. 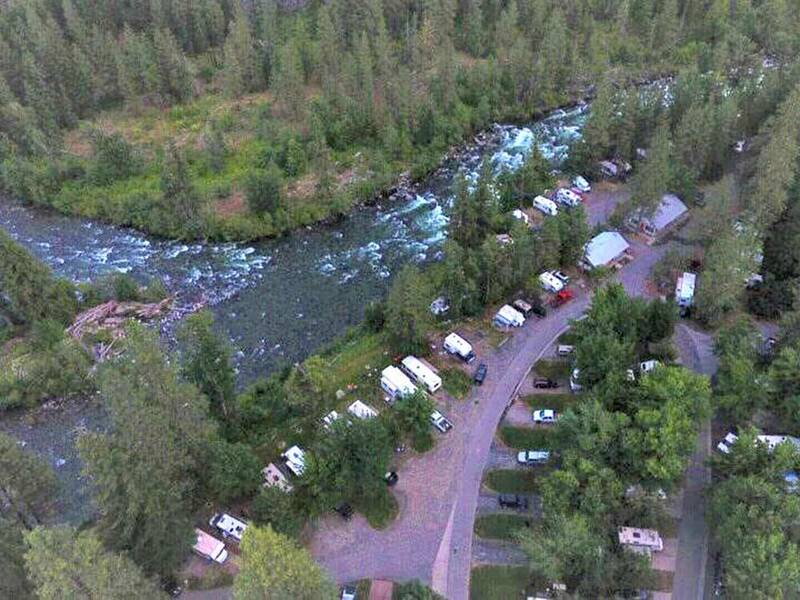 We will visit this area again and make the Icicle River RV Resort our port of call. This park is very organized in how it runs. When you drive in, someone walks up to greet you and ask your name for the reservation list. You go into the office, check in and they then show you were your space is and assist you in parking. The grounds are well kept and most of them are shaded with trees. It appears to be more of an adult park, but there were kids there and they were well behaved. It was not noisy at night and the campers there were friendly. The facilities were very clean, the showers cost .25 cents and I did not have to keep adding quarters. They have a laundry room with coin operated washers and dryers. It is a decent size room and has a table and chairs with games, books and magazines so you can sit and play games or read if you want to wait for your laundry. There us also a nice building that can be rented out if you want to have a large group party or BBQ. I really enjoyed my stay here and plan to stay many times again.